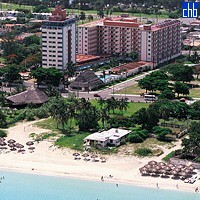 The Hotel Sunbeach is just about 130 mts from the beach, 20 Km from the Varadero International Airport ¨Juan Gualberto Gomez¨ (about 20 minutes by car) and 2 Km from the center of Varadero (about 5 minutes by car). 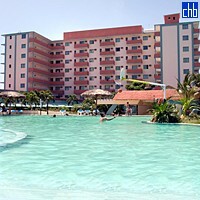 The hotel offers a restaurant with buffet, 2 bars, snack bar, shop, executive hall, swimming pool for children and adults, money exchange, safe-deposit box, tourism bureau, taxis, parking lot, facilities for handicapped, post office and medical services. 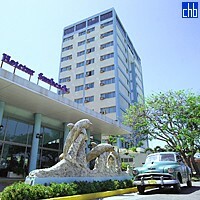 Hotel Gran Caribe Varadero Sunbeach was formerly know as Hotel BelleVue Sunbeach and Hotel Hotetur Varadero Sunbeach. 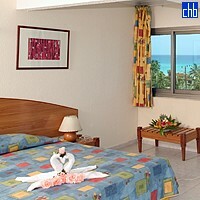 145 air-conditioned rooms with private bathroom, telephone, radio, satellite television and mini-bar (upon request). 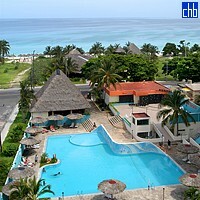 The 127 Ocean View Rooms at Hotel Gran Caribe Sunbeach in Vardero are very similar to the standar rooms and all have a terrace or balcony with a stunning view on the ocean.